Just when we thought higher taxation and new regulations weren’t enough in the buy-to-let market, from 1 April 2018, it will be unlawful for landlords to grant new property leases with an Energy Performance Certificate (EPC) rating below E. This is when the new Minimum Energy Efficiency Standard (MEES) comes into effect. The legislation forms part of a wider package of energy efficiency policies designed to reduce the impact of the built environment on the UK’s carbon emissions. 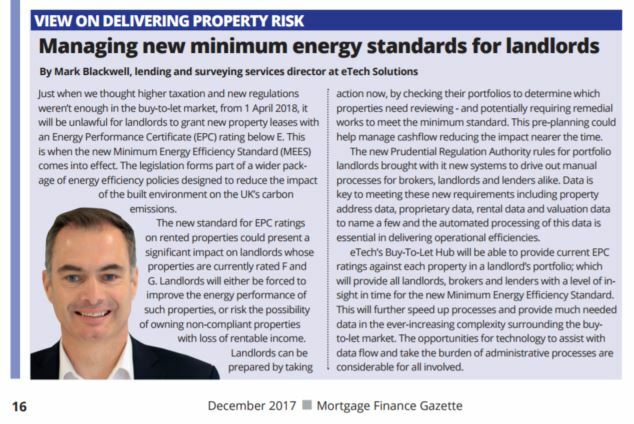 The new standard for EPC ratings on rented properties could present a significant impact on landlords whose properties are currently rated F and G. Landlords will either be forced to improve the energy performance of such properties, or risk the possibility of owning non-compliant properties with loss of rentable income. Landlords can be prepared by taking action now, by checking their portfolios to determine which properties need reviewing – and potentially requiring remedial works to meet the minimum standard. This pre-planning could help manage cashflow reducing the impact nearer the time. The new Prudential Regulation Authority rules for portfolio landlords brought with it new systems to drive out manual processes for brokers, landlords and lenders alike. Data is key to meeting these new requirements including property address data, proprietary data, rental data and valuation data to name a few and the utomated processing of this data is essential in delivering operational efficiencies. eTech’s Buy-To-Let Hub will be able to provide current EPC ratings against each property in a landlord’s portfolio; which will provide all landlords, brokers and lenders with a level of insight in time for the new Minimum Energy Efficiency Standard. This will further speed up processes and provide much needed data in the ever-increasing complexity surrounding the buy-to-let market. The opportunities for technology to assist with data flow and take the burden of administrative processes are considerable for all involved.